Having any sort of wild animal inside the walls of your home is an incredibly annoying experience. The thumping, squeaking, and scratching is enough to cause a headache. Beyond the noise, did you know that wild critters in your walls have the potential to spread parasites and infectious diseases to you and your family? If you suspect that you have an animal stuck in your wall, give Critter Control® of Miami a call right away. Generally, animals small enough to become trapped in your walls enter your home through openings in your attic or basement, as these provide the easiest means of entrance. Additionally, basements and attics are low-traffic areas, meaning that animals easily come and go without being noticed. 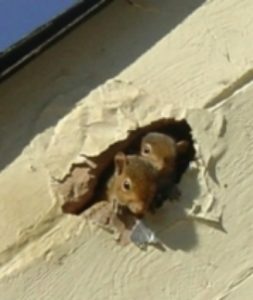 Most wild animals that enter homes are in search of dark, secluded corners to nest, which often leads to them finding their way into your walls where they become trapped. Inspection: Our expertly trained technicians will conduct a thorough inspection of your home to find animal entry points and determine the severity of your animal problem. From there we work with you to develop a plan that works for your needs and budget. Removal: Once we determine the location of the animals within your walls, our animal removal experts are able to implement the most humane, effective methods of removal to ensure the infestation is gone for good. Exclusion: Upon removing all offending critters from your walls, we go through and thoroughly seal any entrance points like holes or cracks, and can install mesh screens over ventilation ducts to prevent a repeat incident. We know just how bothersome it can be to have an animal trapped in the walls of your home, so allow the animal removal experts at Critter Control® of Miami to make that problem a thing of the past. Give us a call today at 305-258-3587 to schedule your home inspection.